Overview - Io, Jupiters innermost moon, hosts mining colony Con-am 27, a high-tech hellhole. There Marchal William T. O'Niel probes some mysterious deaths among the miners. In pursuit of the truth, he's alone. 'Outland' wasn't the first film to shift elements of the western to a sci-fi environment, and it certainly won't be the last, but it's still a relatively unique combination, one that makes for a wonderfully entertaining motion picture that might otherwise be thought of as a generic crime thriller. In fact, it could be argued that the marriage of the two genres essentially masks a rather simple plot that could just as easily take place on modern-day Earth. But the subtlety and restraint shown by writer/director Peter Hyams when merging the two vastly different styles manages to elevate the story into something fresh and terrifically engaging. Aspects of either genre serve only as backdrop or narrative device for telling this crime drama that serves as a clever indictment of corporate conspiracy and greed which devalues the lives of the working class. Set in the far distant future, the merger of the two genres is immediately apparent but never brought to the forefront, something in the fashion of 'Star Wars' with lawless gunslingers walking about. Instead, it's an understated framework inside a remote mining outpost functioning on Io, one of Jupiter's many moons, and order is kept by a small band of peacekeepers, led by Sean Connery as Federal Marshal O'Niel. It's one of the reasons I find the movie so brilliant and still highly enjoyable. Hyams isn't constantly reminding his audience of what he's doing beyond the initial opening with the explanatory title cards. Yet, there's a rustic Wild West appeal to the overall film, thanks in part to the stage design and the cinematography of Stephen Goldblatt. Story-wise, Hyams doesn't shy away from stock characterization, such as Connery epitomizing the rugged town sheriff. As the bringer of justice and social order to the seemingly chaotic frontier of space, Connery's O'Niel stumbles upon a conspiracy to hide several unsolved deaths of miners. There isn't a whole lot for the Scottish actor to do other than act the determined and deeply committed lawman, but what he does he does exceptionally well, being a hard-nosed peacekeeper that won't back down in a fight. Hyams does give the character a bit of depth as a married family man on the brink of losing what he cherishes the most because he believes so strongly that what he's doing is the right thing to do. And as with everything else, Connery shines in these moments, carrying the thought of his wife and son heading back to Earth without him in his eyes and powering his will to fight. Helping the marshal discover a secret drug-ring operating within the colony is the feisty, contentious town doctor, played delightfully by Frances Sternhagen. She's perfect as the spirited foil, almost comic-relief, to Connery's stern temperament, coming to his cause at just the right moment when the man needs the assistance the most. Her involvement in the cover-up is somewhat of a mystery because she doesn't perform autopsies of the dead, though it does become fairly clear when the sergeant (James Sikking), replacing the customary trusty deputy, turns out to be paid a hefty sum to look the other way. While two dealers appear to do most of the footwork, the man at the center of it all is none other than the head-honcho of the mining facility (Peter Boyle doing his best as the greedy, ruthless landholder typically seen in Westerns). We could argue that last bit is a spoiler, but in actuality, Hyams makes that little piece of information pretty obvious early on. Discovering who's behind this large-scale crime is not really the point. In fact, it's used within the narrative as a means of generating tension and suspense because we know who the cause of the rampant drug use is, hiding the deaths of innocent workers in order to keep profits rising. As O'Niel follows the clues and gathers the evidence to prove his suspicion, those involved will do anything to defend the flow of money, driving the plot toward a spectacular 'High Noon' showdown. Filled with a cold mechanical atmosphere and the ethereal music of Jerry Goldsmith, Peter Hyams's 'Outland' is wildly entertaining sci-fi western warning of a corporate future where our greatest enemy remains the monetary greed plaguing our society. 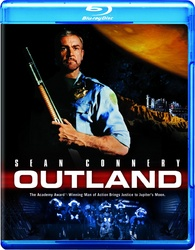 Warner Home Video brings 'Outland' to Blu-ray on a Region Free, BD25 disc inside a blue eco-vortex keepcase. At startup, the disc goes straight to a main menu still with generic options and music in the background. The print used for this 1080p/AVC MPEG-4 encode appears to be in pretty good shape, because 'Outland' looks great on Blu-ray. It doesn't quite match the best we've seen from other movies of the same period, but this high-def transfer is a vast improvement nonetheless over the terrible DVD counterparts. Presented in a 2.40:1 frame, which is closer to its original aspect ratio and much preferred to previous letterboxed releases, it comes with the expected blurry sequences due to age, but the image is surprisingly sharp and distinct for the most part. Viewers can make out every wrinkle on Mr. Connery's face, and the smallest details of the mining outpost are plainly visible. Contrast is comfortably bright with clean, crisp whites, giving the picture a renewed, cinematic appeal. Colors are not particularly upbeat, which is deliberate to the cinematography, but they accurately rendered and consistent from beginning to end. The more problematic issues come from the wavering black levels, looking deep and intense one minute and murky the next. Exterior shots are excellent with rich contrast between light and dark, but several interior scenes can appear washed out, ruining some of the finer details in the shadows and making the natural film grain seem a bit noisy. It's not to the movie's detriment, however, as the overall presentation looks great on high-definition video, a significant upgrade from the previous DVD incarnations. As with 'Altered States,' which hit cinemas the prior year, the sound design for 'Outland' was a bit of a pioneer, with a soundtrack that is essentially an early form of today's 5.1 surround system. Without any way of actually confirming this DTS-HD Master Audio codec derives from the original 70mm 6-track magnetic print on which it was recorded, this Blu-ray presentation appears to be faithful to the intentions of filmmakers. The design doesn't do much with the available back speakers like in Russell's movie, but Hyams' sci-fi Western makes excellent use of the stereo soundfield, which I'm assuming was always the intention of the new technology. Channel separation is well-balanced with flawless movement that perfectly matches the action. Off-screen effects broaden the soundstage with imaging that's convincing, and the excellent directionality nicely generates a persuasive sense of space. Jerry Goldsmith's ethereally jarring musical score takes greater advantage of the soundscape by bleeding into the rears and immersing the listener. Vocals are plainly audible and well-prioritized while dynamic range remains wide and cleanly rendered. One of the best features of this early surround mix is the boosted low-frequency effects, which come off surprisingly hearty and accurate with excellent response for a 30-year-old movie, making this generally-stereo track a great lossless listen. Only the original theatrical preview is offered as a standard feature. Written and directed by Peter Hyams, 'Outland' is a sci-fi western starring Sean Connery as a deeply committed lawman, the cult film remains a wildly entertaining flick with a spectacular 'High Noon' showdown. The Blu-ray arrives with a great audio and video presentation that greatly improves upon previous home video releases, but sadly, comes with only one exclusive supplement. Fans will surely want to pick this up just for the joy of seeing Connery shoot bad guys with a shotgun...in space. Recommended.